1.Applications are invited from the employees of Telangana State for May – 2015 session Departmental Tests Examinations Scheduled to be held from 04-10-2015 to 09-10-2015 at all the 9 District Head Quarters of Telangana State (Ranga Reddy District clubbed with Hyderabad). Note: 1. The candidates are instructed to read the notification thoroughly before applying. For any details and clarifications the candidates are advised to visit Commission’s Official web-sitehttp://www.tspsc.gov.in. Handwritten/Typed/Photostat/Printed application forms will not be entertained. 2.The candidates are instructed to be careful while submitting the details at the time of submission of on-line application as the details once submitted cannot be amended at all. It is candidate’s responsibility that the details submitted are true and genuine. No representation or request in what so ever manner will be entertained in this regard. 3.The candidates are instructed to note that the wrong bubbling of any part of OMR Sheet cannot be amended at all. The use of whitener and over writing, if any, and improper bubbling leads to invalidation of answer sheet. 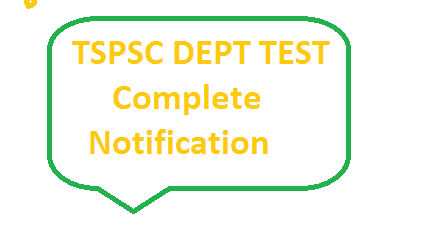 STEP 1:-The candidates have to login to the website (www.tspsc.gov.in) and enter his/her particulars such as name, father’s name, date of birth and papers to be applied, Mobile Number,email-ID etc., While filling the same, the candidates have to ensure that there are no mistakes in it. The Commission bears no responsibility for the mistakes, if any, made by the candidates. STEP.2:-Immediately on entering the above details, the applicant will get payment gatewaySTEP.3:-The applicant should pay the prescribed fee as specified under through any of the four modes of payment online. Separate instructions have to be followed for each mode of payment.STEP.4:-After payment of fee, the PDF Application will be generated which contains the particulars furnished by the candidates. The ID No in the PDF Application form has to be quoted for future reference/correspondence.